We provide exceptional quality concrete scanning services in Sydney and the surrounding suburbs. Contact the Sniper Concrete Scanning Services team for an obligation-free quote today. We specialise in professional concrete scanning services around Sydney and the surrounding suburbs. Our professional concrete scanning services offer a professional and affordable solution to builders, engineers and contractors. We have been providing concrete scanning services in Sydney for the many years which has allowed us to become one of the leaders in the industry. Our experienced team of professionals offer an end to end service including investigating and evaluating the most complex surface areas. We only use the highest quality equipment that allows us to provide accurate results. Our experienced team have the equipment on hand to handle the most complex tasks. Our results are always presented to you in an easy to understand format that will allow you to make informed decisions before penetrating any structure. We aim to provide the most accurate data for you to make safe and accurate choices. Our certifications allow us to handle projects of any size. We are certified through companies like Telstra and CM3. Our experience paired with our certification is what seperates us from the competition. We are committed to providing safe and reliable services. With no job to big or too small our professional concrete scanning services can handle any special requirements or job site restrictions. We understand that every job is different which is why we consider ourselves to be adaptable to every job site. How does our concrete scanning services work? 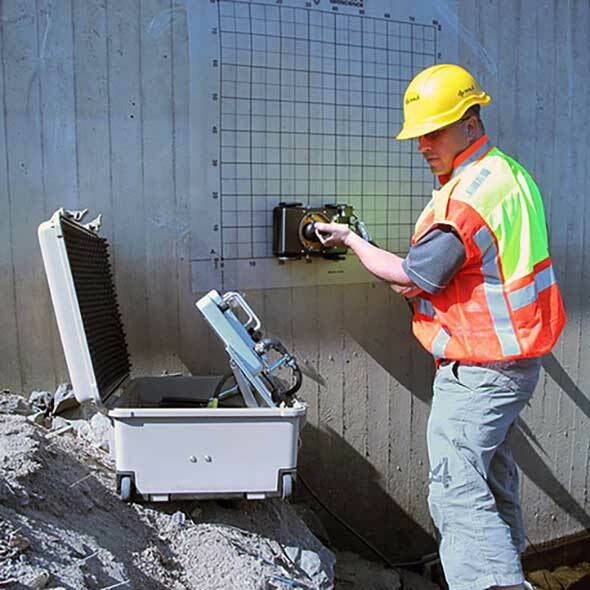 Our professional concrete scanning offer a full end-to-end service for architects, engineers, plumbers and other trades that require on site location of data cables and pipes. Our slab scanning is a non destructive form of testing that provides you with an in-depth analysis of what lies beneath the concrete structure of sub floor. We utilise the use of our state of the art equipment that can accurately locate hidden features beneath the struture that can prevent damage to the structure, your machinery and even the operator. Our GPR scanning system delivers results twice as fast as other popular concrete scanning which allows us to provide the results on site within a matter of minutes.Our customer base includes surveyors, architects, engineers, plumbers, electricians, consultants to name but a few. Our team is focused on safety which is why we are dedicated to provide accurate and safe results to all of our customers. If you require concrete scanning services in Sydney and the surrounding areas, contact us today for advice or for a quotation. We have engaged Sniper Concrete Scanning in Sydney several times now to scan our slabs before we core hole. We have always been impressed by the fast, professional and the quality of service. Highly recommended. A reliable concrete scanning company in Sydney which we have dealt with on many occasions now. Quality work and good value for money service.